Duma dum dum.Holi is on the way and to celebrate this auspicious occasion I wanted to cook something good.And today S also wasn’t in town and I got an opportunity to prepare this authentic recipe,yes folks he doesn’t prefer garam masala dishes,he loves only Amchi food.Though I do not need any reason to cook my loving Biryani it did save my time minus Amchi cooking today.Who doesn’t love Biryani, that too when it is dum biryani and cooking rice dishes is my forte after seafood.So here I present before you’ll yummilicious Birrrrrrrryani,duma duma dum, Egg dum biryani. Soak the rice for 20 minutes in water meanwhile prepare the rice preparations. Heat ghee in a cooker,add onions and fry until light brown in colour,add spices,cashewnuts and saute for a second. Add soaked and drained rice,yellow colour,salt to taste,water and take a boil,check salt and close the lid. Take exactly one whistle and off the flame,once the pressure releases open the lid and gently transfer the rice in a big plate with care,cool it and keep it aside. For the curry heat ghee in a pan and fry onions until reddish in colour,add ginger garlic paste,garam masala powder,turmeric powder,biryani masala and saute for half a minute. Add green chillies,coriander leaves and mint leaves and saute in low flame for 5 minutes. Add tomatoes and saute for a minutes,add curds,cashew paste and salt to taste. Add water if necessary and lastly add boiled and slit eggs.and cover the dish and keep it low flame for 5-6 minutes. Keep the curry dry or little wet as desired. Take a wide borosil bowl and spread a layer of rice,followed by gravy,spread few brown onions and repeat the procedure until you finish both the gravy and the rice with rice as the final layer followed by the brown onions. Cover the dish with a cling film and microwave for 7 minutes. Onions-2,thinly sliced,apply a pinch of salt and sugar and deep fry in hot oil until crisp and light golden brown. You may also add few raisins to the rice. (I forgot to add). You may also prepare the rice in a wide vessel with the same proportion. You may also prepare the rice in the rice cooker. You may also pamper the biryani by spreading few strands of saffron soaked in milk(3-4 tbsp) before giving dum. 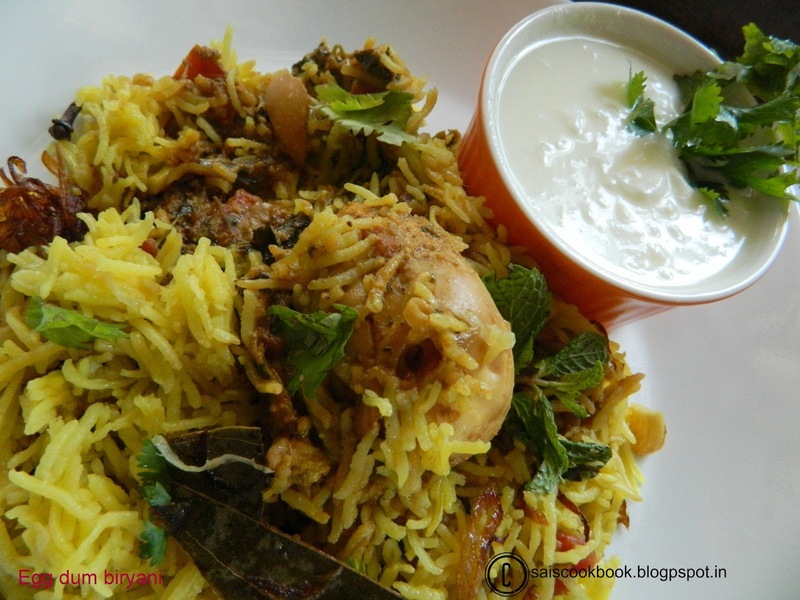 You may also prepare this biryani with soya chunks,babycorn,prawns etc by adjusting the spices. 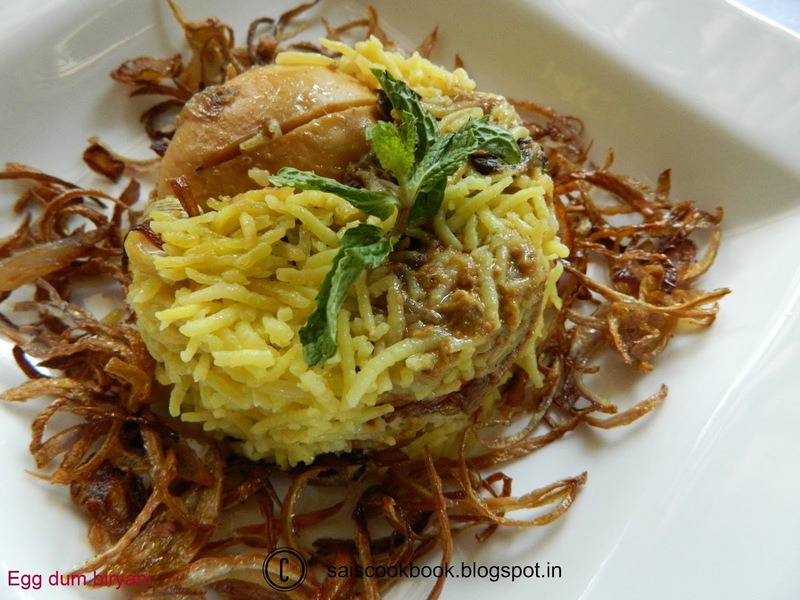 looks really yummy saigeetha… biriyani is a treat, any time! It was Kathy’s request that I prepare this. And, when it was done it’s aroma was fabulous, its texture immaculate and its taste out of the world! Thank you for sharing this recipe.